SOLIDWORKS 2019 includes new software updates and features that make the design process a breeze. Improvements to the Design Ecosystem were developed to get the right information in the right hands, reduce roadblocks between departments, and make it easier for you to design better products, faster. In Episode 3, we take a deep dive into the Design Ecosystem of SOLIDWORKS 2019 to see how new features will allow you to create, manage and collaborate to put your designs ahead of the curve. These updates have helped close the gap between all the various departments responsible for delivering a central project work. Updates to SOLIDWORKS Electrical and PCB programs give you more performance and user interface supplement, and allow you to make collaboration with design and mechanical more streamlined. These enhancements will also help you validate your designs with new technology in programs like Plastics, that puts you ahead of the curve when getting your products to market. eDrawings has gotten even better for 2019! Updates allow for more files to be supported. Configuration data can now be viewed for native SOLIDWORKS parts and assembly files. While familiar tools are still available, updates allow for less lag time when viewing models. SOLIDWORKS Treehouse 2019 delivers great new capabilities for creating and managing assembly structures. New settings allow for maximizing branch organization to manage critical information. Updates also allow you to include the component graphical preview images in Microsoft Excel that improves clarity which reduces the risk of misidentifying parts. SOLIDWORKS MBD or Model Base Definition 2019 updates put the model at the heart of your design and manufacturing process by providing a single source of intelligent information that removes the time and cost associated with creating traditional documentation. Updates add support for sheet metal annotations, capture all of your manufacturing information in a bend table, and allows for greater control and protection of access to PDF files. SOLIDWORKS CAM Milling 2019 delivers great new features that reduce the time it takes to program your parts! Updates like the new corner slowdown tool allows you to vary the feed wave based on distance, resulting in increased tool life and improved service finish. SOLIDWORKS 2019 updates also add great productivity enhancements for creating everyday machining operations, like new options to control hole start and end position, providing much greater flexibility when you are defining drilling operations. Tolerance based machining in SOLDWORK CAM Turning 2019 introduces some powerful new capabilities that dramatically reduce the time required to generate CNC programs for turn parts with close tolerances and close finishes. Updates allow you to do things like apply preferred machining strategies to the tolerance scheme at just a single button click. SOLIDWORKS Inspection 2019 adds powerful new enhancements that give you greater flexibility when generating first article inspection or quality assurance reports. Updates include many more options for managing the grouping of characteristics giving you complete flexibility over the way in which annotations are ballooned. These enhancements will allow you to generate first article inspection reports more efficiently than ever! 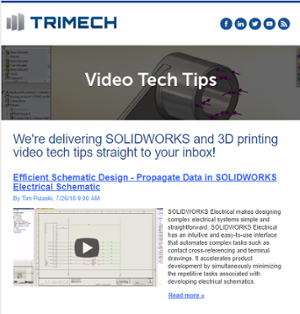 SOLIDWORKS Electrical 2019 makes it easier than ever to make projects get done faster with the right information. Now, the dynamic connector has new configuration and insertion options, and creating and customizing reports is now easy through new modifications to the report editor. Updates also include new enhancements to electrical and routing support in line devices. SOLIDWORKS PCB 2019 allows for collaboration with other programs like CAD and Mechanical to create easier program use. These new updates let you know the exact location of mountings and mechanical features on the board through new collaboration features. You can now import new materials, such as copper. SOLIDWORKS Simulation 2019 updates will save you a lot of time in generating reports and understanding the true behavior of your assemblies. Updates allows for static studies with contact and connectors can be copied or dragged and dropped into nonlinear and dynamic studies. Pin connectors have more mobility too! SOLIDWORKS Plastics 2019 updates created geometric improvements to make easy to use simulation even simpler. Geometry based gate locations, as well as the new ability to create control valves geometrically like mesh control, allows for you to address problem areas earlier than ever before.